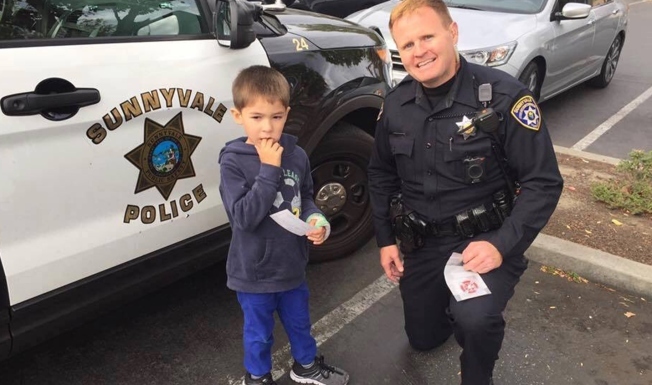 A Sunnyvale police officer on Monday came to the aid of a distraught special needs boy, who was kicking and screaming, in the throes of a breakdown. Corinne Oestreich took to Facebook to express her gratitude for the policeman, identified only as Officer Ben, who helped her son, Hunter, who struggles with Tourette syndrome, anxiety and obsessive–compulsive disorder. According to the Sunnyvale Department of Public Safety, the officer's name is Benjamin Holt. While Oestreich attempted in vain to get Hunter into her car, he simply continued to strike himself in the face, she said. That’s when Holt arrived on scene, and turned the day around. “He very calmly was able to distract my Hunter, let him see the inside of the patrol car and even took time to demonstrate to Hunter how to look for finger prints!” Oestrich wrote. “Thank you thank you thank you,” Oestreich said, concluding with a heart emoji. Holt declined to speak with NBC Bay Area, but department spokesman Capt. Shawn Ahearn said that he was "proud" to have been able to use techniques — on interacting with special needs children and adults — that officers had been trained in earlier this year. Holt was "really just happy that everything worked out OK," Ahearn said.